History of Cell Barnes | Cell Barnes | Out of Sight, Out of Mind? A work in progress. Thanks to Highfield Park Trust. This article is reproduced from a pamphlet compiled by the Social Works Department of Cell Barnes Hospital, as their contribution to commemorating the 50th Anniversary of the Hospital in 1983. Although we have not sought their permission, for they no longer exist, I am sure they will not object! Matthew Paris, the 13th Century historian monk, wrote that in about the year 1140, a priory dedicated to the Blessed St Mary was founded at a place called Sopwell by Geoffrey de Gorham, Abbot of St Albans. He framed rules for the 13 nuns who were resident, decreeing that they should wear the black habit and follow the rules of St Benedict. The Abbot and other benefactors gave properties to the nunnery, among them almost certainly Cell Barnes, in order that the rents and food grown could be used to support the nuns. St Albans was the third printworks in England, and in 1481, and again in 1486, the Boke of St Albans was produced. The author of at least part was Dame Juliana Berners, writing on hawking, heraldry and a particularly good treatise on angling. It was believed that the Dame was a Prioress of Sopwell and used the cell as her retreat, where she would follow the activities that she wrote about so knowledgeably. Originally entitled the Boke of Haukying and Huntying, this was the first printed book in the English language that featured dogs. What is almost certain is that the section on hunting came from her hand, for it is signed alongside her words “Explicit Dam Julyans Barnes in her boke of Huntyng.” Dame Juliana’s list of dogs reads, “ First there is a greyhound, a baftard, a mongrel, maftyfe, a lemor, a spanyell, kenettys, terours, bocheris houndes, mydding dogges, tryndeltayles and prikherid curris.” This list remained the sole printed contribution on dogs in English until 1576. Local feeling is the name Cell Barnes was a corruption of her name over the years – so Berner’s cell to Cell Barnes. The last Prioress of Sopwell was Johanna Pigot who was paid a pension of £6 a year. Ann Boleyn is reputed to have come to Sopwell to avoid London, with Henry VIII courting her there, and in 1553 marrying her nearby. In 1531, the Cell Barnes part of Sopwell was leased to John and Nicholas Ayleward. When the nunnery of Sopwell was disbanded, a Letters Patent was issued detailing a grant by Henry VIII to Sir Richard Lee and his wife Margaret, of “divers messuages, tenements, land, wood, ground and hereditaments, part of the late dissolved Monastery of Sopwell.” It was dated in the 30th year of Henry VIII (1539). Included in the list of properties was “one messuage and all those lands call Sell Barnes with the appertenances in the said parish of St Peter.” Built at this time, and still standing, was the property called Little Cell Barnes, which was just outside the hospital grounds in Cell Barnes Lane and is now used as a Social Club for local residents. Sir Richard died in 1575 and was buried in St Peters Church, and the estate including Cell Barnes passed to his elder daughter Mary Coningsby, later Pemberton, and on her death the property passed to her sister Ann Sadlier, who passed it on to her son Richard. In 1669 Thomas Saunders, who had married Helen Sadlier, sold the property to Sir Harbottle Grimston of Gorehambury, whose descendents owned Cell Barnes for the next 260 years. During this time the land was leased and farmed by various families. Richard Thrale, in 1973, published a chronicle of his family entitled A New Thraliana. From this book, we discover that, in 1646, namesake Richard Thrale married Martha Aylward, and it is possible that Martha was left Cell Barnes in a legacy from her father. From about 1690, Cell Barnes was farmed by members of the Thrale family until 1736, when two brothers died. We read that a niece, Anne, received household goods from Cell Barnes farmhouse. To keep the land fertile, there were cropping clauses in the lease. The first year should be fallow or turnips, the second wheat, rye or barley and the third year, corn, with parts of the property pasture. There were squabbles in the family about these conditions and about hedges and fences being ruined. In 1765, Joseph Bunn became a tenant of Cell Barnes and seven years later he was granted a 21-year lease at £75 per annum. The first large scale map of Hertfordshire, published by Drury and Andrews in 1766, includes “Sell Barnes” with Sopwell Barnes and New Barnes close by. Between 1800-5, a large brick farmhouse was built, called Great Cells Barn and had 208 acres. The old farm, just down the lane, was called Little Cell Barn with 140 acres. From 1838-81, Great Cell Barnes was occupied by farmers, and for the next five years Viscount Grimston is listed as occupant. From 1901-1917, the house was the residence of the Hon. F and Mrs. F.W. Anson, and Mrs. Anson was noted for her breeding of Buff Orpingtons (poultry) for show. From 1922, the occupant of the house was Viscount Encombe. Hill End Hospital was built in 1899 in 184 acres of grounds. An extension was built in 1907, and within a short time the Committee was searching for more land. In the 1920s, 82 acres of Cell Barnes, adjoining Hill End and belonging to the Earl of Verulam, came on to the market. It was purchased by Hertfordshire County Council and a “colony for mental defectives” was built, to be run in conjunction with Hill End. On the property was Great Cell Barnes House, which was extended and used as a Nurses’ Home, with original features in the house being preserved. The layout of the grounds was carried out by the Head Gardener, George Dollimore, and the Victorian Gardens, close to the great house, were preserved with their formal rose gardens, tree fringed lake, stables and magnificent fir trees. The Hospital was officially opened on 5th October 1933 by the Minister of Health, Sir E. Hilton Young, and transferred to the NHS on 1st July 1948 . Maintaining the tradition, a thriving farm was managed at Cell Barnes, growing various crops, including potatoes. Cows, pigs and poultry were kept, the produce being used by the hospital, and patients helped on the farm and in the gardens. The farm was discontinued in 1965 in line with Government policy that all hospital farms should cease. Much additional building occurred in the Hospital over the years to accommodate staff and for administration, training and recreational centres. A very active Friends of Cell Barnes Hospital Association was formed, and in May 1958, H.R.H. the Duke of Gloucester opened the Staff and Sports Social Club. As with Hill End Hospital, changes in the treatment of the mentally ill resulted in the inevitable closure of Cell Barnes Hospital. On the closure of the hospital in 1998, the Nurses’ Home had long been empty and eventually the ownership was transferred to St Albans Council. By the time the current tenants – Emmaus – took occupation, much of the building had been vandalised and the gardens neglected. The lake was completely silted up and was transferred to Highfield Park Trust in 1998. There was a planning agreement for new housing and the creation of 60 acres of public open space across both hospital sites. The Hospital eventually closed in 2000. However, the process of closure was well managed, patients were relocated to smaller units and with the formation of the Highfield Park Trust in 1996, the Trust was able to take “ownership” of the Park area and thus manage and control the redevelopment process – so as not to inherit, as was the case at Hill End, a neglected and vandalised landscape. Wherever possible, the Trust also salvaged garden benches, plants (especially roses), and the puddingstone to create features in the Park. Virtually every hospital building was demolished – except the still functioning Pill Packing Unit (PPAS), the Nurses’ Home (now Emmaus), the Nurses’ Training Centre (now the Birch Centre and occupied by the Ladybirds Nursery), a small Occupational Therapy Unit (Birch Centre Annexe) and of course, West Lodge (the Park Office). Of the farming features, the orchard still survives and we like to think of the Buff Orpingtons busily scratching away at the ground beneath the trees! This page was added on 13/01/2010. I was the first Cadet Nurse to be taken on at Cell Barnes Hospital in the 50s under Matron Wooding and her Deputy Miss Lake. I worked as a Student Nurse on all the female wards and in the O.T. Dept. I remember George Dollimore. I think he eventually married Miss Prior, the Nurses Home Sister. I have many pictures of patients and staff at that time and look at them fondly, remembering my youth. I moved to Wynchlands Crescent in the early 90s. I was very taken with the handsome water treatment and pumping works building (with its rather brutal concrete water tower next door), on the site perimeter off Hill End Lane. I think it was a shame that it got demolished and wondered if anyone has any photos or plans, or records of its build, use and maintenance and when it ceased operation? michelle again – sorry i forgot to say that i think the mental hospitals should not have been closed down, to have a big mental hospital and in such beautiful grounds must have made patients feel happy and the nurses too. I myself know that working in such a beautiful place made me feel happy to go to work. I loved biking down Cell Barnes tree filled lane as well , my pet dog came from Cell Barnes Lane. Mentally ill people need a hospital and some can not cope on their own in the community and some are unsafe people to others as well as to themselves. This is all Margeret Thatchers fault as she closed all the mental hospitals . I know that I prefer a hospital to a small mental unit if I were a patient. A hospital gives one a sense of more secruity and help etc etc as well .thankyou for reading my comments kind regards michelle. 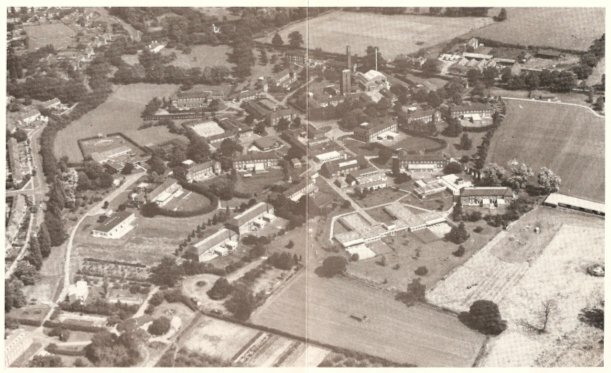 An aerial view of Hill End Hospital?